More and more people suffer from lower back pain. Usually, this is a result stemming from the irritation of your sciatic nerve. But this type of pain can also spread down to your limbs and feet. This pain can have an effect on one's daily routine, and many have been looking for ways to naturally get rid of it. Well, look no further. The nerve we mentioned, sciatic, lies deep in one's buttock. 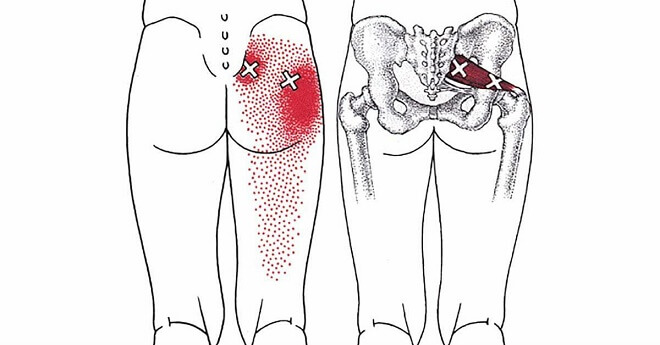 And due to its closeness to the piriformis muscle, if there is any swelling or constriction in this specific muscle, the consequence can be nerve pain and irritation. This muscle joins the top of your femur to your spine. It plays a vital role in the outwards movements of your upper leg, foot, and hip. And the nerve in question passes beneath this muscle. Having explained this, in some cases, it may occur that the nerve passes through the muscle, and this can lead to so-called ‘sciatica symptoms’ , which are caused by the piriformis syndrome. This leaves the individual with hip and lower back pain that doesn't seem to go away on its own. This, in turn, leads to limited movement and poor balance. Luckily there are exercises one can do to fix this, but it is always advisable to consult with your physician as there may be other, underlying causes for the pain you feel. Another word of advice when doing these piriformis stretches is to always stay within your own personal limits of comfort. Remember, don't push it as it might lead to further complications. In this specific case, pain (even a little amount) is NOT gain. Now simply lean forward using your torso. Extend the both arms in a parallel direction with the ground. It's important to keep the spine straight while doing this. Hold it for 30 seconds to a minute. Once you're done, do the same after you've switched legs. Start off by sitting on the floor and stretch the legs as far apart from each other as you can. Remember, the moment you start feeling any pain or discomfort, stop! That means this is your limit and you shouldn't try to exceed it by stretching your legs any further than they already are. This stretching exercise also requires you to be sitting on the ground. Simply position your feet's soles in front of your pelvis. Make sure your spine isn't bent, and that the affected hip remains directly on top. Gently and slowly pull your affected leg's knee across your body's midline using your opposite hand. Do this until you feel a stretch, but remember, no pain. If there is some, it means you just need to loosen the stretch a little bit. Hold this position for a few moments. Then try and bend yourself a bit further. Once again, the most crucial thing is that you don't feel pain while doing this.